Chapter 23 deals with The First Russians. I was tempted to work on a kokoshnik craft, but I only have one daughter and I usually include both children in our projects. I did not want to make different crafts. So I decided to cook a big pot of borscht, according to the recipe provided. 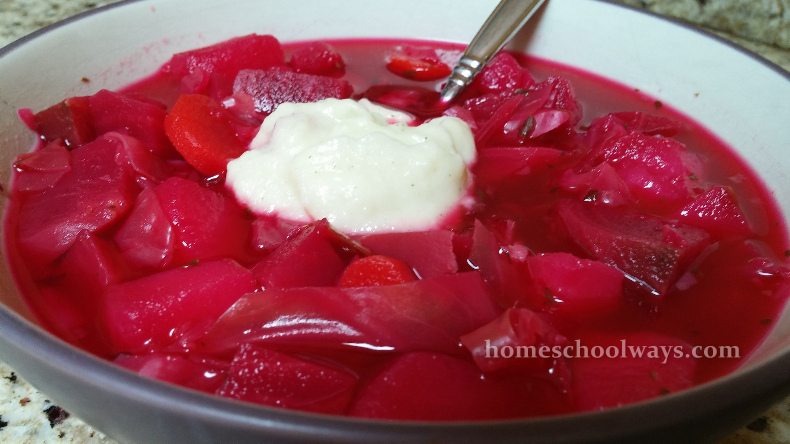 Borscht with vegan sour cream – despite its beautiful color, the children refused to even try it. Since we make a similar soup in Romania, I knew the taste I was trying to achieve. It always helps to know what your goal is when you are cooking foreign recipes, right? Well, I still changed a few things around because for instance I did not have tomato paste and used tomato sauce instead. But it came out nice and mouth-watering and, apparently, it’s all for me, because my kids will not touch it. My husband is not a red beet fan, so he is not interested either. Oh well, more for me. We have dear friends who are Russian, so this has been a good chapter to read and find some elements we can share with them. The stories of Ivan the Great and Ivan the Terrible were, of course, daunting, but it’s history. Things happen. We worked on the map and the coloring page. They ran to the world map we have on the wall to find Kiev and Moscow there. I don’t know why. Usually, they are content with the SOTW map. Maybe because I told them it’s close to Romania? Or because our closest friends come from Russia? I grew up in an Eastern Orthodox Christian family in Romania, so I was very interested in the details about how the Rus became Christian. I would have to disagree with Susan Wise Bauer when she says the Orthodox do not worship the images (or paintings) of saints and Mary or Jesus. Maybe that’s what the official catechism says, but that is not what happens in real life. When we attended church, blessing oneself in front of these icons, bowing before them, kissing them and worshiping them was very much a part of the ritual one was expected to perform. Narration is still not easy for my oldest. I don’t even attempt it with my youngest. The comprehension questions receive good answers, in full sentences, but the narration exercise just seems a bit too difficult. So I read it to them to give them an idea of what to look for and how to put it together themselves. All in all, a good chapter. I enjoyed learning some things I did not know and they liked listening to the stories. Do you still have the recipe from the book? We have our activity pages stored away deep under the stairs but my son was wanting to make it again. it’s been a few years. The ones online are nothing like the original one from the book we made. Some even have meat or kidney beans in them. Can you help? I am not sure I should put Ms. Bauer’s recipe online because it is out of a copyrighted book. I will say that I adapted it quite a bit myself based on the ingredients I had around the house. If I were you, I would just use a recipe from the internet. Keep out unwanted ingredients and taste as you go along, adapting to your son’s taste buds. You can do it!